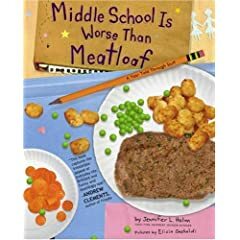 My sister's new book, Middle School Is Worse Than Meatloaf: A Year Told Through Stuff, is finally out! Even though it just hit the shelves (July 24, 2007, pub. date), the funny thing is, it's been in the works longer than Babymouse. I contributed 3 cartoons to Meatloaf, which I drew before Babymouse was even a scribble on a napkin. The drawings are ostensibly from the protagonist's older brother.